This morning started out grey and windy, with heavy showers. Now the rain has gone, and we are left with candy-floss clouds and very blustery, autumnal winds. Floppy, brown horse-chestnut leaves are blowing from the trees, covering the pavements and paths with a slippery, soggy mess; and tiny helicopters are cascading from the hornbeam trees. Unlike ash and sycamore keys which have two wings, hornbeam keys have three wings, and although they don’t look at all aerodynamic, they certainly spin quickly as they fall. The hornbeam is a deciduous broadleaf tree commonly found in the oak woodlands of Southern England. Growing to about 30 metres, these trees can live in excess of 300 years. The name ‘hornbeam’ comes from ‘horn’ due to the hardness of the wood, and ‘beam’ meaning tree in Old English. Hornbeam timber is creamy white, extremely hard and strong, and is mainly used for furniture and flooring. Traditionally it was used for ox-yokes, butchers blocks and cogs for windmills and watermills. The fruit is a small nut about 3-6mm long, held in a leafy tri-lobed bract. The bract is asymmetrical, and it is this unbalanced nature that helps it spin as it falls. A few days ago the squirrels were scurrying through the hornbeam trees in my garden, tearing at the keys as they searched out the tiny nuts. Cracking sounds as sharp teeth bit into the nut shells, and shredded leaves fluttering to the ground, betrayed their presence. 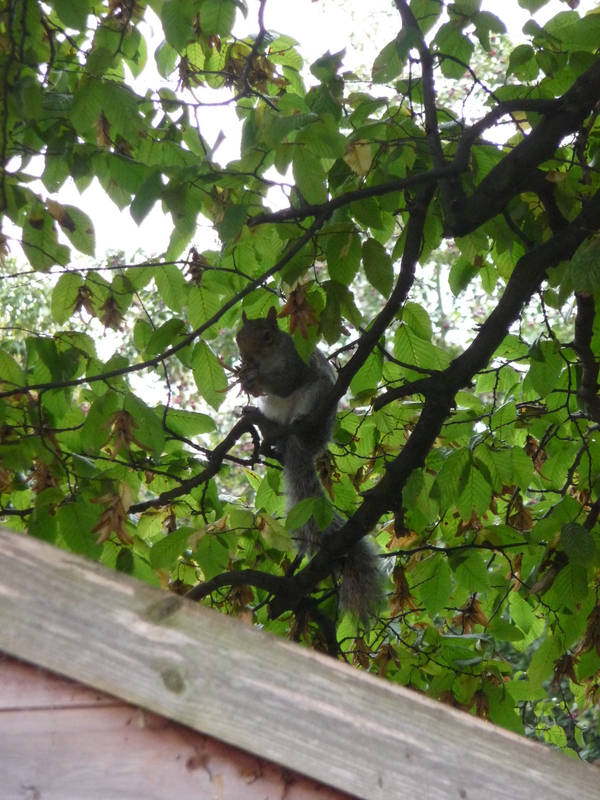 But now the acorns are ripe, so the squirrels have abandoned my hornbeam, for larger treasure in the garden next door. Just over a year ago; last June to be precise, I visited a friend in Littlehampton. It was a cold, damp and wind-swept day, and I posted a couple of ‘deserted beach’ pictures. This year, it couldn’t have been more different. The summer sun was shining brightly, the sky was blue, with high vaporous swirls of cloud, and the slight breeze was definitely a warm and gentle one. Despite being midweek, and most children not yet broken up for the school holidays, there were plenty of people spread out on the beach. We splashed our way through cold wavelets in the sandy shallows, while some braver folk were swimming in the icy water. The beach shops and stalls were open, selling everything from fish and chips and ice-cream, to beach shoes and buckets and spades. Gaudy summer dresses and sun hats were everywhere, and the ambient mood was light-hearted and carefree. What a difference a bit of sun, and a bit of welcome warmth make to an English summer beach. Today has again been wet and windy, with wall to wall grey cloud. Cold needles of persistent rain pummel the huge stretches of surface water, each raindrop merging into a great expanse which no longer drains away into the over-soaked ground. The standing water seems to swell and seeth with malicious intent, drenching passers-by with each vehicle that passes. Layers of low cloud scud across the sky, trailing dark wind-blown tendrils, and releasing yet more rain. There was a brief respite an hour or so ago, when I ventured out for a quick walk with the dog. But as I returned home, so the rain started again. The cold damp greyness seems to have seeped into my bones and into my soul, and I feel as melancholy as the weather. Under this steel grey blanket it’s hard to believe, but somewhere up there the sun is still shining. 2014 – In like a Lion! I awoke this morning to sun streaming in through the window, bright and cheerful. It’s certainly a welcome change after the last few weeks of dismal, wall-to-wall grey clouds, rain and more rain, wind and more wind. The weather in the UK so far this year, has been truly awful. I am filled with awe when I see the ferocious intensity of the crashing waves, the destructive roaring power of the wind, and the relentless advance of encroaching flood-waters. And when I see on the news the devastation of flooded homes, livelihoods destroyed, fields become vast lakes, roads turned to waterways, I realise that I’ve come off pretty lightly. Well! So much for my post about spring, and warm weather on the horizon. Today we awoke to snow, and so far it has snowed hard most of the day. It may be March, but I think someone’s hit the rewind button, and we’ve been unceremoniously plunged back into the depths of winter again! My dog Brinny still wanted her walk of course, so I wrapped up well, and we ventured out into the cold. The sky was grey and leaden, and the wind bitingly cold, flinging myriads of tiny snowflakes and ice-crystals in our faces. The snowdrops are completely buried, and the newly emerged daffodils are bowed down, their heads hanging sadly. Spring has turned tail and fled, leaving winter to reign supreme for a little longer.